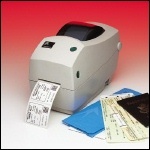 The ultra-compact TLP 2824-Z™ bar code label printer, for print widths up to 2.2 inches, brings powerful performance to applications requiring both direct thermal and thermal transfer printing. Its ease of use, including its OpenACCESS® design and clear media window for simple media loading and monitoring, makes the TLP 2824-Z a foolproof means to increased workplace efficiency. Model 282Z-11100-0001, 203 DPI, 4 IPS Print Speed, 8MB DRAM, 4MB Flash, Serial, USB, US Plug, ZPL Language. Discontinued - Call for replacement. Model 282Z-11101-0001, 203 DPI, 4 IPS Print Speed, 8MB DRAM, 4MB Flash, Dispenser, Serial, USB, US Plug, ZPL Language. Discontinued - Call for replacement. Model 282Z-11102-0001, 203 DPI, 4 IPS Print Speed, 8MB DRAM, 4MB Flash, Cutter, Serial, USB, US Plug, ZPL Language. Discontinued - Call for replacement. Model 282Z-11200-0001, 203 DPI, 4 IPS Print Speed, 8MB DRAM, 4MB Flash, Parallel, US Plug, ZPL Language. Discontinued - Call for replacement. Model 282Z-11201-0001, 203 DPI, 4 IPS Print Speed, 8MB DRAM, 4MB Flash, Dispenser, Parallel, US Plug, ZPL Language. Discontinued - Call for replacement. Model 282Z-11400-0001, 203 DPI, 4 IPS Print Speed, 8MB DRAM, 4MB Flash, Parallel, 10Base-T Prt Server, US Plug, ZPL Language. Discontinued - Call for replacement. Model 282Z-11401-0001, 203 DPI, 4 IPS Print Speed, 8MB DRAM, 4MB Flash, Dispenser, Serial, 10Base-T Prt Server, US Plug, ZPL Language. Discontinued - Call for replacement.